Very rarely does a game catch me off guard and completely surprise me. Most of the time this happens when I know very little regarding the game. And so it was with Star Wraith 3 (the 3rd in the StarWraith series). The space-sim genre has not seen too much action recently. Sure, there was Freelancer earlier this year, but there was no denying it was quite a bit different from what we had been used to in space-sims. If you want to relive the excitement and strategy of older space sims, Star Wraith 3 brings the glorious feeling back. Star Wraith\'s game play is wildly fun. You aren\'t just flying around and firing on enemy spaceships, but the game includes strategic value which adds to game play depth. You not only have counter measures for evading missiles, but you can use your environment as well. I was able to evade a missile by escaping into an asteroid field. 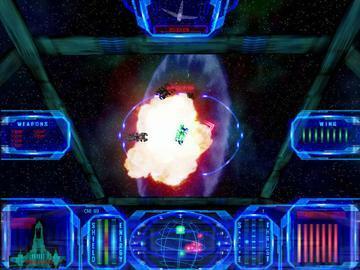 You can also use afterburners and special jump jets to try and outmaneuver the enemy. You may do ok without really getting into the strategic side, but to become a really good pilot, you will need to spend some time learning the strategic elements. For example, learning the art of balancing your shields and energy. Learning how to properly evade the enemy using jump jets or afterburner. And...YES...there are also wingmen. There are a few, easy to understand wingmen commands (\'attack my target\', for example). There are over 20 missions in the single player campaign, but you won\'t be playing all of them your first time through. The direction of the campaign depends on which missions you choose and your outcome. This leads to a dynamic campaign system. You will need to try different paths and replay the campaign if you want to play all the missions. The campaign was fun, challenging, and you do get rewarded with a relatively short cut scene if you complete the game with the correct path. In the end, the single player campaign is fairly short and does not have a very strong storyline. I would have liked to see a more in-depth storyline to make you feel even more a part of the game. One very exciting feature is the ability to fly down to a planet. Adding this to the game is brilliant and adds to new strategies, new scenery, and...it\'s just COOL! There is also a map where you fly inside an asteroid cave. The game includes an option for creating Instant Action missions. These can be random or user created settings. These are very fun (just like the single-player campaign) and I find myself continually going to Instant Action. Some nights I\'ll just play a few rounds of instant action. This feature certainly adds to the replay value. The enemy AI can be pretty challenging. They can be difficult to track at times, and also know when to throw a bunch of missiles at you. In addition, their shields are able to recharge, so if one gets away, it will most likely reappear with full shields. Asteroids, explosions and nebulas look fantastic. They certainly add to the feeling of \'being there.\' There are also some nice lens flares. Overall, the look of outer space is nicely done. But the ships themselves have very plain, gray/brown textures. Planet surfaces are simply green textured rolling hills. And the HUD appears a bit chunky. There is room for improvement, but the current graphical weaknesses do not in any way take away from the exciting game play. The developer continues to improve the game, so the graphics can only get better. In fact, the developer is already reworking some of the ship s and they will look much better. That will go a long way to improving the visual feeling of the game. The sound is ok. There is some nice music, but I wish there was more. The voices and weapon sounds are decent, and again, I wish there were more. What\'s there isn\'t bad, it\'s just not enough. 4Interface I did find the configuration menus a bit confusing. Once I figured out how to configure my joystick, everything was up and running very smoothly. The built-in tutorial explains most of the HUD and how to control your ship. When outfitting your ship, you simply click on which weapons you want to load. Very easy. There are a few stability issues listed in the README and on the forums. Most of these are related to video cards and are along the lines of needing to use the right driver. I did experience one of the problems listed. It only happened once and I simply shutdown and restarted the game. Unless you have a problem with shooting down spaceships, this game is totally clean. Overall, I am extremely pleased with Star Wraith 3. If the developer adds a good, strong storyline, and makes some graphics updates, the game will definitely get pushed into the ?A? grade. Star Wraith 3 was definitely a nice surprise and helped to fill a void in a genre that has been relatively silent. For $19.95, this is an amazing buy. Whether you are a longtime fan of old-school space sims or you want to try something new, Star Wraith 3 is fun and exciting. There is also multi-player capability which extends the life of the game even longer. Now for the amazing part about this game. It is an independent developer. With a few exceptions (music, voices), one person created the whole thing. Not only are you getting a great game, but you are getting friendly service too. That\'s why I think this game can only get better. The developer listens to feedback and continues to release updates.